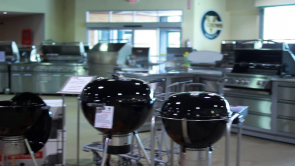 Duff Dixon, Owner of Ontario Gas BBQ discusses the various types of Barbecues available to consumers and how to choose the right one for you. Propane Barbecue– Is a type of gas bbq which uses the standard 20 pound tank Gas bbq’s have control knobs on the front which makes lighting it and controlling temperature easy and convenient. Natural Gas Barbecue – Gets hooked up to your house line. Gas is generally more convenient as you never have to worry about refilling the tank. Natural Gas barbecues also have control knobs on the front which makes lighting it and controlling temperature easy and convenient. Charcoal barbecues– Takes charcoal as fuel, which takes a bit longer to light up and heat. The heat is regulated through air vents rather than knobs. This is a popular method of cooking as it can be portable and many consider the taste to be superior. Electric Barbecues– Smaller in size and cooking surface which makes them ideal for condominium living or small families. They are a good alternative to situations where gas or charcoal bbq’s are not allowed. Smokers– Type of barbecue which cooks long and slowly over a very low heat which results in a delicious, tender meat. Ontario Gas BBQ is the World`s Largest Barbecue and Grill Store and World`s Largest Barbecue and Grill Showroom displaying well over 150 LP barbecue grills (Propane), NG barbecue grills (Natural Gas), natural charcoal BBQ`s, built in grills and mobile, electric grills, smokers, iGrill and Thermapen, pits and ceramic cookers both in horizontal and vertical configurations to suit any budget. As the World`s Largest Barbecue and Grill Store Ontario Gas BBQ also has a room devoted to natural, pure hardwood charcoal and also specializes in horizontal smokers, pits and quality and value priced pig, pork, lamb and goat spit cookers and rotisseries.